The Allegheny County Courthouse in downtown Pittsburgh, PA, is the city’s most significant architectural landmark. Designed by Henry Hobson Richardson in 1884 and completed in 1888, the Courthouse (and the former Jail) is a National Historic Landmark. 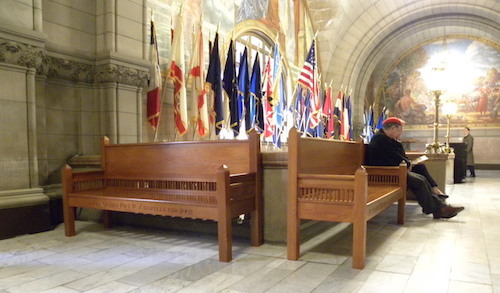 The Allegheny County Historic Properties Committee, chaired by PHLF President Arthur Ziegler, initiated the Courthouse Bench program in 2003 so inappropriate furniture in public hallways could be replaced with custom-designed benches. Since then, gifts from many people have funded the construction of 28 solid White Oak benches featuring mortise and tenon construction, hidden dovetails, and a finish that matches the original millwork in the Courthouse. Designed by County Architect Samuel Taylor, each bench is hand built here in Pittsburgh by Wilson & McCracken. The donor’s name, or the name of someone the donor would like to honor, is inscribed on the front of the bench. If you and/or a group of friends would like to sponsor a Courthouse bench, please contact Frank Stroker (frank@phlf.org; 412-471-5808, ext. 525) for further details. Your contribution, payable to PHLF, is fully tax-deductible. The price per bench is reduced if two, three, or four benches are ordered at one time.